Globally, there are now well over 6 billion email accounts — just under one account for every person on Earth. And those accounts aren’t collecting dust: on average, people collectively send more than 3 billion non-spam email messages every hour. According to McKinsey, the average worker spends 13 hours a week just reading and responding to email. And the total is growing. Some people think the dominant role of email will fade. There certainly are plenty of alternatives — social media, messaging apps and a myriad of other online communication tools. No doubt, the email experience is far from perfect; the sheer volume can be difficult to manage, creating widespread “email anxiety.” Some people periodically declare “email bankruptcy,” delete everything in their inbox, and simply start over again. In fact, according to a recent survey conducted by Edison (see our inaugural State of Email report), more than a third (37%) of Americans say they feel overwhelmed by email every day, with 32% receiving up to 100 emails per day. A whopping 87% of survey respondents said they have taken steps to manage email overload — 73% said they have unsubscribed from unwanted email, while nearly half (44%) of respondents admitted they have spent hours deleting emails they don’t want. All that said, the astounding utility and flexibility email offers makes it likely to remain a core online tool for many decades to come. At Edison Software, we’re working on ways to evolve and adapt email to improve the experience. That’s the core of our business: Edison Mail is an app for iOS and Android that applies artificial intelligence techniques to your inbox to produce a better experience for users. We’re working hard on making email a more effective and efficient communications tool — and we have some thoughts about the future of email which we’d like to share. But let’s start with a look back at how far email has come in 35 years. On August 30, 1982, 16-year old V. A. Shiva copyrighted “EMAIL” (or, electronic mail) after converting commonplace office mail at the University of Medicine and Dentistry of New Jersey into an all-electronic version. Previously, documents were created on computers, then distributed on carbon paper — “Cc” originally meant “carbon copy.” Shiva also copyrighted the basic interface we still use today with the fields “To,” “From,” “Cc,” “Bcc,” “Subject,” “Reply,” “Reply All,” “Forward” as well as email “bodies” and attachments. While Shiva gets credit for establishing the basic structure of modern email, the computer engineer Ray Tomlinson generally gets credited as the inventor of email. In 1971, he implemented the first email program on the ARPANET, the Defense Department-created precursor to the Internet. Shiva argues that Tomlinson’s innovation was more like text messaging than email. 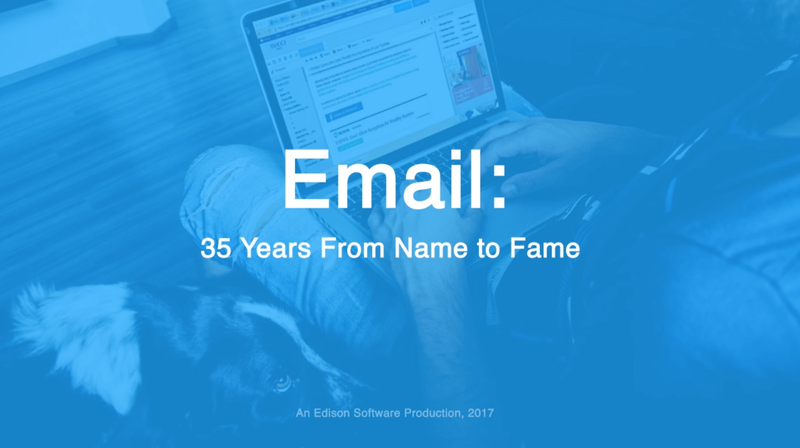 Email’s popularity soared with the emergence of personal computers in the 1980s, and accelerated with the rapid spread of both mobile devices and ubiquitous network connectivity. Edison found that today most Americans (85%) use a smartphone to access email — it’s constantly at our fingertips. With email, we communicate with friends, families and colleagues; track online purchases, manage our schedules; share photos and videos; and conduct transactions. We even read and respond to emails in bed — 41% of Americans (according to our survey) to be exact. Another 39% use email while eating food, 34% while on the go, 24% while in the bathroom, and even while spending time with a significant other (21%). The bottom line is, not having email is almost unthinkable. Email will always have communications as a core function. But the platform’s role in digital lifestyles will continue to change over time, offering more conveniences and prominence across personal and professional ecosystems. Email will continue to improve personal workflows. Email capabilities are already trending toward simplifying workflows to save everyone time and effort. The practice of referencing several different online sources to search for information is becoming less and less necessary as more mail services incorporate automated features pertaining to tasks like tracking package information, importing contacts, creating email signatures, etc. At Edison, our current Mail app already weeds out spam, groups receipts and travel information into dedicated folders and provides automated updates on flights and package deliveries. Email intelligence will reach new levels. A few weeks ago, we launched a feature called Smart Reply, which gives users the ability to quickly respond to emails by choosing from a selection of AI-generated context intelligent replies. A new Security Assistant also offers users an easy method of safeguarding all of their email accounts from breaches of other apps or services they might use — directly from the convenience of their mailbox. Higher levels of intelligence in a mailbox will drive more innovations. Similar to self-driving cars and more personalized intercommunication, email may someday become smart enough to self-compose, self-delete, self-schedule meetings, etc. Reliance on email as an identity management utility will grow. Email remains the epicenter of an individual’s digital lifestyle. All online transactions — whether shopping, banking, social media, or messaging services — require a valid email address to use or to recover access to an account. Verifying identity through email, and using an email account as a repository for personal digital activity, will reinforce the platform’s path toward becoming a type of digital social security number in the future. As our reliance on email as an identity management necessity increases, so will the need for higher security standards like rights, permissions, and regulations. Creating more intelligent products to serve people at edison.tech.